A new paper calculates the climate sensitivity to greenhouse gases by using seasonal changes to determine the climate response to radiative forcing from the Sun, and then uses the IPCC radiative forcing assumptions of solar forcing and greenhouse forcing to determine sensitivity to CO2. According to the analysis, the climate sensitivity to doubled CO2 is only 0.23C to 0.32C [mean 0.275C], an order of magnitude less than claimed by the IPCC, but right in line with 15 other papers and analyses finding very low climate sensitivity to CO2 of << 1C for a doubling of CO2 levels. Note the 0.23C sensitivity calculation assumes 1 W/m2 of solar forcing has the same effect as 1 W/m2 greenhouse forcing [as assumed by the IPCC], whereas the 0.32C sensitivity calculation assumes solar forcing has a greater effect on climate than greenhouse forcing [as claimed by other papers, due to energetic UV from the Sun only, which can penetrate the oceans unlike IR from greenhouse gases, and potential solar amplification mechanisms]. The author finds sensitivity to doubled CO2 is ~0.5C in the Northern Hemisphere and ~0.2 in the Southern Hemisphere, and that the oceans [more of which are in the Southern Hemisphere] act as a strong negative-feedback cooling agent for the global climate. 20/10/2014 by Magnus Cederlöf . But it felt like it was too easy to get this together. It's very simple calculations done, so someone ought to have thought like this before. But I have not seen any such calculations here before. Therefore do I now up this report here at KU as a kind of "open review". I would first like to have views on whether there is any reason why you could not count on it this way. Then I would like to have comments on whether the report is understandable and if there are unclear parts. Nature performs a continuous experiment with altering the Earth's radiation balance. During the northern hemisphere winter gets more Southern Hemisphere insolation and during the summer, the northern hemisphere more solar radiation. If we consider the northern and southern hemisphere as energetically relatively isolated from each other, we can follow the changes in solar radiation produces a change in temperature. Below are averages for the years 1979-2013 from ECMWF. Note that "irradiance" means "radiation per surface". One can clearly see that the temperature is a little behind insolation on time. It is probably due to a sluggish response especially from the time it takes to warm up lakes and seas. Therefore, it is faster to heat up than the land masses of the oceans. But the system still responds fairly quickly to changes. The maximum temperature is reached after only one month after maximum insolation reached. It is also clear that the northern hemisphere and the southern hemisphere is about the same inertia, but that the temperature changes much less in the southern hemisphere. This suggests that there is a strong negative feedback in the Southern Hemisphere. Flow chart for simple climate model. ΔI is the change in radiation (irradiance), and Dt is the change in temperature. the second A slope factor between insolation and temperature (parameter ki picture above). 3rd A filter value to define the inertia of the system. By adjusting these three values ​​for the northern hemisphere and the southern hemisphere, I try to get a good consistency with the measured values ​​as possible. The result is shown below. 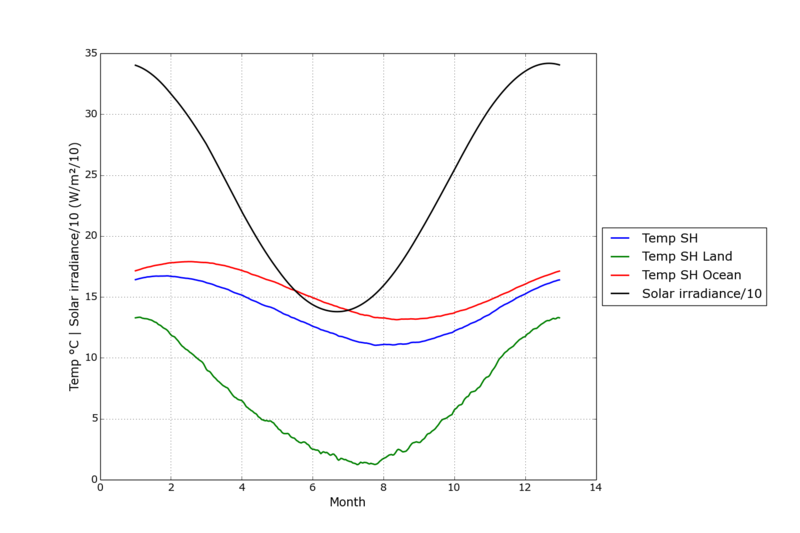 Solar radiation, temperature and simulated temperatures for the southern hemisphere. It is clear that it is possible to obtain a very good agreement between measured values ​​and model. According to the IPCC, a doubling of carbon dioxide levels result in increased radiation of about 3.7W / m² and that this would correspond to about 5.1W / m² increase in solar radiation. Therefore, we can use the simple climate model described above to calculate how much higher temperature 5.1W / m² would provide. The result is that the so-called climate sensitivity, ie a doubling of carbon dioxide, would provide approximately 0.5 ° C in the northern hemisphere and 0.2 ° C in the southern hemisphere. But this calculation does have its uncertainties. The greatest uncertainty is: if there is a (unknown to me) significant energy flow between the hemispheres, which is seasonal, the Earth's albedo changes with solvinkeln, and on the assumption that 3.7W / m² carbon radiation corresponding to 5.1W / m² solar radiation would be wrong. The first uncertainty can increase the climate sensitivity figure, and the other two can potentially lower the climate sensitivity figure is significant. 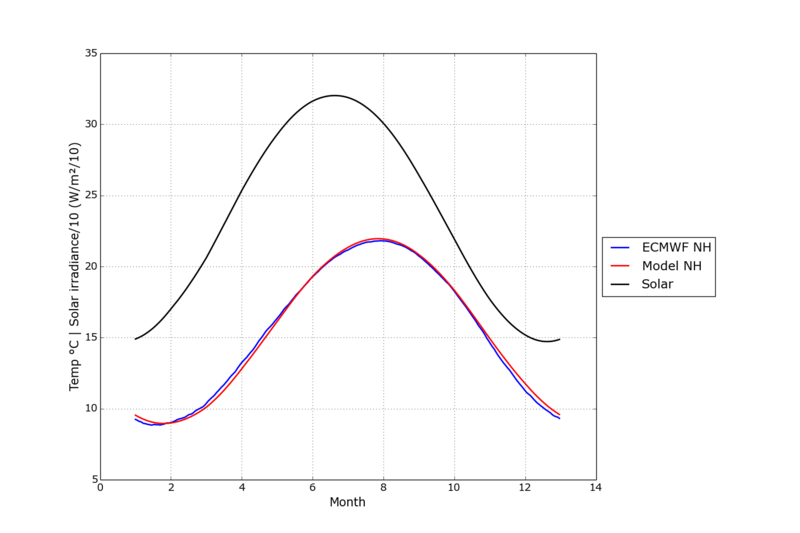 By looking at how the changed solar radiation over the annual seasons a ect the two hemispheres it is possible to get an estimation of how the climate system reacts to changes in the radiation balance. The inertia in both northern hemisphere (NH) and southern hemisphere (SH) is about the same, but the temperature change in response to radiation change is much larger in NH than in SH. This implies a large negative feedback in the SH. 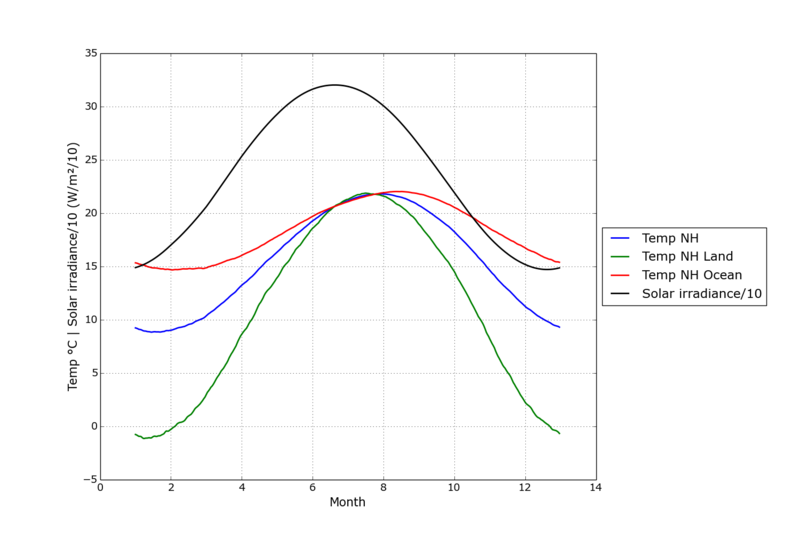 Based on daily temperature data from ECMWF, a climate model with only three parameters is created. It is shown that this model can simulate the temperature response to the changes in solar irradiance (radiation per area) fairly well. If it is assumed that the energy exchange between NH and SH can be neglected, it is possible to calculate how the hemispheres react to changes in radiation forcing. If IPCC's assumption of forcing effi cacy is used, a 3.7W/m2 of greenhouse gas forcing, that is the climate sensitivity, should correspond to about 5.1W/m2 of solar forcing. This model show that 5.1W/m2 of radiation forcing would give approximately 0.5°C higher temperatures on the NH and approximately 0.2°C on the SH. Understanding how earth responds to a change in incoming radiation from the sun is essential to understanding how earth will react to increase level of so called greenhouse gases. This study uses the fact that nature conducts a continuous experiment in changing earth's radiation balance. During the northern hemisphere (NH) winter, southern hemisphere (SH) receives increased solar radiation, and vice versa. In this experiment I have used an average of the 2 meter temperature from ECMWF's ERA-interim reanalysis  which provides, amongst others, daily gridded temperature data for complete earth starting at 1979. This temperature is compared to the change in solar irradiance (radiation per area) to the two hemispheres. I have assumed that the solar irradiance is in average 338 W/m2 and that albedo is 0.3. This means that the average energy in ow on earth is in average 338*0.7=237 W/m2. Since both hemispheres show similar inertia but large di erences in temperature response compared to irradiance change, it implies that SH has a large negative feedback when the temperature changes. Similar pattern is seen in the difference between ocean and land in NH, where the ocean seems to have a large negative feedback. Therefore, it is reasonable to conclude that rising temperatures over water causes more clouds to form which will hold the temperature change back. 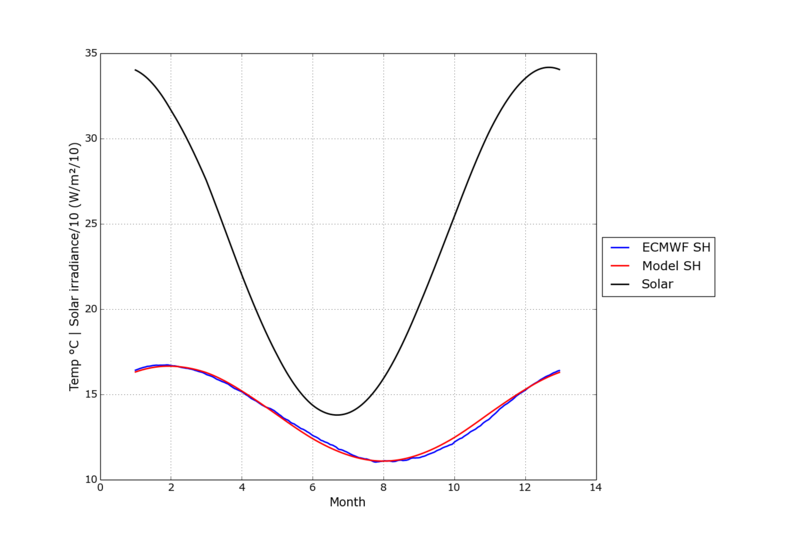 A very simple climate model with only three parameters can simulate the hemispheres temperature response to the seasonal changes in solar irradiance fairly well. By using this climate model, it is possible to estimate the hemispheres temperature response to increased radiative forcing from greenhouse gases. When assuming that the seasonal energy exchange between the hemispheres is neglectable and a doubling of the carbon dioxide level would cause 3.7W/m2 forcing, a climate sensitivity gure can be calculated. This climate sensitivity has in this case been calculated to about 0.5°C for NH and about 0.2°C for the SH if IPCC's assumptions of efficacy is used. In this case it is assumed that 3.7W/m2 of greenhouse forcing corresponds to 5.1W/m2 of solar forcing. But if the efficacy of greenhouse gases is signi cantly lower as at least one study indicates , the climate sensitivity will also be signi cantly lower. If the albedo is sensitive to solar declination. The 1st factor, if found signi cant, will increase the climate sensitivity figure, but the other two can signi cantly decrease the climate sensitivity figure. The strong negative feedback over the oceans can also explain why the biggest temperature rise during the 20th century occurred on land. But the temperature increase that has been measured is bigger than what would be expected due to the changes in the carbon dioxide levels according to this study. Therefore it is reasonable to assume that natural variations also causes the radiation balance to change and also in this case the land will experience the biggest temperature change.